Western blot analysis of extracts from MCF7 and DLD-1 cell lines using EHMT1 (E6Q8B) Rabbit mAb. Immunoprecipitation of EHMT1 from MCF7 cell extracts. Lane 1 is 10% input, lane 2 is Rabbit (DA1E) mAb IgG XP® Isotype Control #3900, and lane 3 is EHMT1 (E6Q8B) Rabbit mAb. 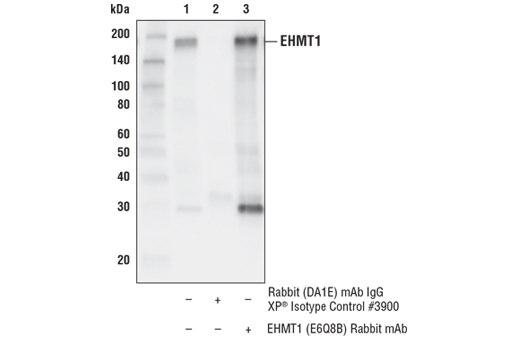 Western blot analysis was performed using EHMT1 (E6Q8B) Rabbit mAb. Mouse Anti-rabbit IgG (Conformation Specific) (L27A9) mAb (HRP Conjugate) #5127 was used as a secondary antibody. 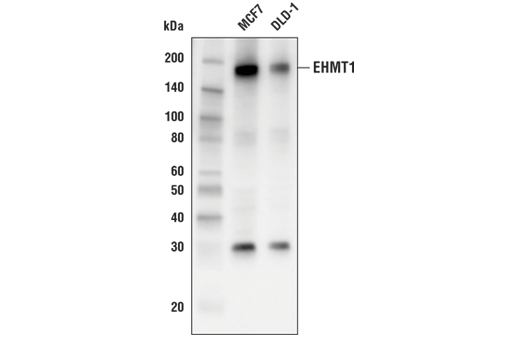 EHMT1 (E6Q8B) Rabbit mAb recognizes endogenous levels of total EHMT1 protein. Monoclonal antibody is produced by immunizing animals with a synthetic peptide corresponding to residues surrounding Ala196 of human EHMT1 protein. Euchromatic histone-lysine N-methyltransferase 1 (EHMT1), also referred to as G9a-like protein 1 (GLP), is a histone methyltransferase that specifically mono- and dimethylates lysine 9 of histone H3 (H3K9me1 and H3K9me2, respectively) in euchromatin. EHMT1 is a member of a family of histone lysine methyltransferases that contain a conserved catalytic SET domain originally identified in Drosophila Su(var)3-9, enhancer of zeste and trithorax proteins (1). Although EHMT1 can homodimerize in vitro, it is typically found as a heterodimer in vivo with its paralog G9a, also known as EHMT2; together these proteins function as the major euchromatic histone H3 Lys9 mono- and dimethyltransferase, creating transcriptionally repressive marks that facilitate gene silencing (2,3). The EHMT1/G9a complex also contains Wiz, a zinc finger protein that is required for EHMT1/G9a heterodimerization and complex stability (4). Wiz contains two CtBP co-repressor binding sites, which mediate the association of EHMT1/G9a with the CtBP co-repressor complex (4). In addition, EHMT1 and G9a are components of other large transcriptional co-repressor complexes, such as those involving E2F6 and CDP/cut (5-7). EHMT1/G9a methylates several non-histone substrates, including DNMT1, CEBP/β, HDAC1 (8), and p53, specifically at lysine 373 (9). p53 Lys373 methylation was initially reported to inhibit p53 activity, suggesting that EHMT1/G9a inhibitors could help treat p53-positive cancers (9). However, a more recent study found that human G9a activated p53 and that elevated G9a-p53 expression was associated with increased survival in lung cancer patients, suggesting that further studies are required to better understand the biological significance of this methylation event (10). Lastly, defects in EHMT1 are the cause of chromosome 9q subtelomeric deletion syndrome (9q-syndrome), also known as Kleefstra syndrome (KS). Common features of KS patients are moderate to severe intellectual disability, autism, epileptic seizures, microcephaly, and dysmorphic features (11). Tachibana, M. et al. (2001) J Biol Chem 276, 25309-17. Tachibana, M. et al. (2002) Genes Dev 16, 1779-91. Tachibana, M. et al. (2005) Genes Dev 19, 815-26. Ueda, J. et al. (2006) J Biol Chem 281, 20120-8. Ogawa, H. et al. (2002) Science 296, 1132-6. Shi, Y. et al. (2003) Nature 422, 735-8. Nishio, H. and Walsh, M.J. (2004) Proc Natl Acad Sci U S A 101, 11257-62. Shankar, S.R. et al. (2013) Epigenetics 8, 16-22. Bittencourt, D. et al. (2012) Proc Natl Acad Sci U S A 109, 19673-8. Rada, M. et al. (2017) Oncogene 36, 922-32. Iwase, S. et al. (2017) J Neurosci 37, 10773-82.